Bookings: Maggie Sansone's Celtic & Renaissance Wedding Music (extensive site with pictures, audio and video) Visit.. enjoy...and book Maggie for your special event! Recordings: www. maggiesmusic.com; CDBaby; iTunes: click on album title and go to iTunes logo to purchase the music. 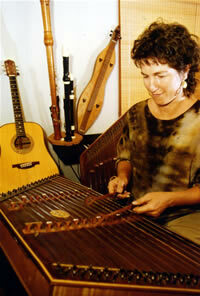 America's premier hammered dulcimer player and recording artist, Maggie Sansone's music and pioneering artistry has brought the ringing beauty of her music to hundreds of thousands of music lovers around the world. Maggie has been featured on CBS-TV Sunday Morning, and NPR's All Things Considered, Performance Today, and The Thistle & Shamrock. As producer and performer, Maggie has performed at the Kennedy Center Concert Hall, National Geographic Grosvenor Auditorium and many other venues; from the large stage to small town fairs, Renaissance and folk festivals, special events and weddings. Maggie brings her unique vision and virtuosity to music of the ancient Celtic lands and more. ANNIE Award for Performing Arts from the Anne Arundel Country Cultural Arts Foundation. Maggie is founder and CEO of Maggie's Music record label. The label, which features over 50 albums distributed worldwide, is an eight time WAMMIE winner for "Record Label of the Year."